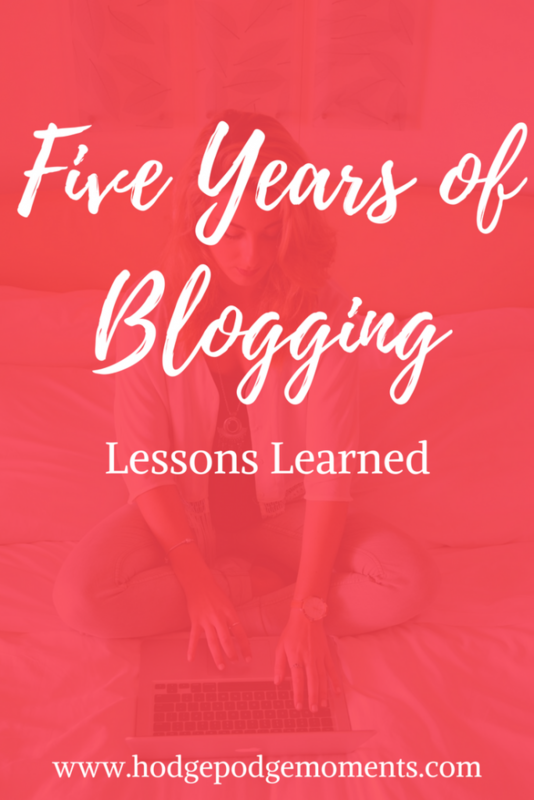 I have been blogging for five years and in those past five years, there have been a lot of lessons learned. I won’t bore you with the story of how my blog got started since you can read all about it here. I will say that there have been many twists and turns in my blogging journey and I’m sure there are many more to come in the future. Each of these twists and turns have taught me a thing or two and that’s what I’m passing on to you today. At times, blogging can be the easiest thing in the world. There are days where the ideas and the words just flow. There are days where people comment and tell me how much they love my blog and the things I’m posting. Or they tell me about how much a specific post helped them out. (These are my favorite by the way!) The easy days are the ones where I’m certain that I found the right path. Blogging is also hard. There are things to juggle and appearances to maintain. It’s hard to take a break without doing a little prep work or losing traffic. It’s an uphill climb that everyone makes at their own pace. Honestly, there are days where I look at my blog and wonder why I spend so much time on it. This is a lesson I learned the hard way. I originally started my blog on Blogger because I knew nothing about blogging and had worked with the platform before. Once I found my blogging tribe, I started to learn that WordPress was the way to go and that it could do so much more for your blog. It took me over four years to finally make the switch from Blogger to WordPress. It’s a switch that I wish I had made sooner – WordPress truly does hold a lot of potential! You don’t need to be everywhere. Facebook, Twitter, Instagram, Pinterest, LinkedIn – so many social media platforms and so little time! In the beginning, it’s hard to figure out where you should be. It seems like all of the big name bloggers are everywhere at once and you feel pressured to do the same. One thing I’ve learned is that you’ll grow faster if you keep your focus narrow. You can grow the other platforms later – for now, focus on one. This one is tricky. When you’re first starting out, it’s hard to justify spending money on your blog. I didn’t spend anything on my blog until I was a few months into blogging and finally decided to purchase my own domain name. Over the years, I have learned to invest more and more as time progresses and I will admit that each investment has helped me grow as a blogger. This one is probably my favorite blogging lesson! It’s important to blog with purpose. Your purpose may be writing as a creative outlet or to pass the time. Or it may be a bigger purpose of bringing in income for your family. The reason for blogging can vary in so many ways, but it’s important to know what your purpose is when you’re starting a blog. Your purpose could very well change with time. After all, this blog started as a hobby blog which then turned into a passion project and now it brings in a little extra income for my family. 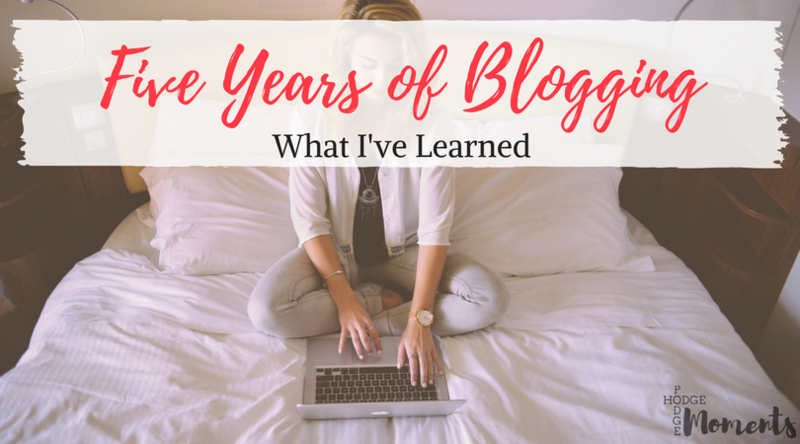 I could probably write several posts worth of blogging lessons – five years is a long time to learn a lot of things. I’m going to cut it off here though so that you can work on your own blog and check out some of the resources I’ve shared below. These are just a few of my favorites when it comes to blogging. I’ll be updating the list from time to time as I discover new favorites. Siteground – This is who I use for my hosting and so far, I’ve been loving their support and the ease of using their website. Things were very easy (and reasonably priced) to set up. Tailwind – This is the site I use to schedule my pins to Pinterest. It makes things super simple and allows for me to keep pinning even when I’m busy with other things. Thinkific – This is the site I use to create courses and programs for my blog. You can get started for free or you can pay to get some really cool features. It’s a great way to create a little income from your expertise and blog. MailerLite – This is the website I use to send out my weekly newsletters. They make it easy to send emails and collect email addresses from your followers. Blogcabulary Ebook – This ebook walks you through all of the terms you’ll see associated with blogging. It’s more than a simple dictionary though – it goes into detail about each term and how it helps your overall blog. There are also tips and advice sprinkled throughout the ebook. A great piece from someone who’s been blogging for a while. I’m only a month into it so it’s good to hear from an experienced blogger and hear their insights on lessons learned. Thank you! Wow! Very detailed! I am happy, you have given me some good pointers! Thanks! I hope they help. 🙂 I tried to stray from some of the typical advice posts that you see. Just started my blog. Awesome information ! Thanks for sharing. Thank you for sharing! I look forward to seeing what happens in th next five years. I love this! Such a great perspective on blogging and the “journey” that is part of being a blogger. I love your advice to keep your focus narrow – it’s so overwhelming to feel like you should be on every platform, all the time. I can’t believe that I put off the switch for so long! I’m definitely glad I made the leap.